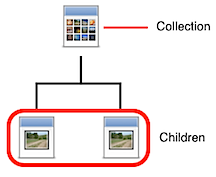 A collection is a special type of page that contains other pages, much like a folder on your computer contains various files. You can nest as many collections within each other as you like. Every site has at least one collection, since the Home Page is actually a collection that contains all the other pages of the site. Consider the example of a simple site below. 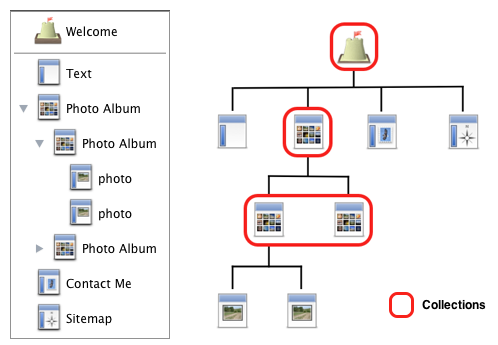 The site structure is shown both in the Site Navigator and in a diagram form. As you can see, there are a total of four collections; they are arranged in a hierarchy. Collections are displayed in the Site Navigator with a disclosure triangle next to their icon. Click the triangle to show and hide the children of the collection. A collection in the Site Navigator. Select "Blog" or "Photo Album"
Select one or more pages in the Site Navigator. Click the "Group" item in the toolbar or choose "Group as Collection" from the Insert menu. Open the Page Inspector then click the 'Collection' tab. You can arrange the order of the pages yourself in the Site Navigator. Pages are sorted in alphabetical order by their Page Title, either from A-Z or from Z-A. Sorts the pages by their date and time. You can sort with the most recent page at the top or bottom. The RSS feed is set so that Sandvox can generate appropriate RSS markup for dealing with attached media. The maximum number of pages to display in the RSS Feed. 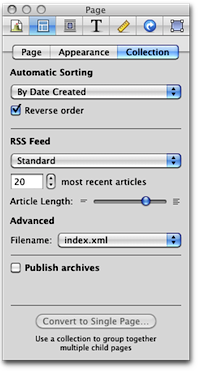 Slide the slider to the left or right to lengthen or shorten the length of the article that shows on the RSS Feed. The truncation taking place here is independent of the truncation chosen in a blog's index inspector [see below], so that while your website might truncate articles very lightly or not at all, your feed might truncate the articles heavily, to encourage your RSS feed readers to come to your website. Index.xml is most common but not accepted by all servers. Some servers, if there is an index.xml present, will try to send the contents of that file — meant for RSS readers — when somebody's browser requests a page. The page that the server serves up should be index.html. If your server has this problem, then you will want to set this value to index.rss for all your collections with an RSS feed. If you are going to be using a Collection Archive you will need to check this box. If you have a collection without any pages in it, you can convert that collection to a single page. You can do that in the inspector on the page selector, collection tab, 'Convert to Single Page...' at the bottom. You can make a single page a collection in the inspector as well.